Rangers chief executive Derek Llambias will address the Scottish FA board on Tuesday to make a case for Mike Ashley raising his stake at Ibrox. The SFA has issued notices of complaint to the club and Ashley due to alleged breaches of dual interest rules. A disciplinary hearing will be held in January, but the informal talks about Ashley increasing his shareholding will be treated separately. Ashley currently owns 8.92% of Rangers International Football Club. 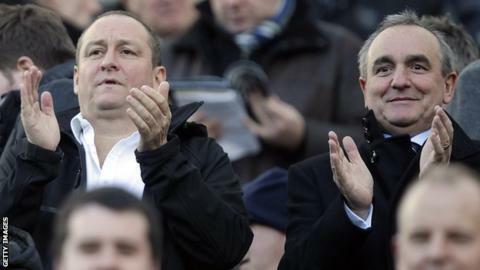 But the Newcastle United owner has previously shown interest in raising that to 29.9%. "Rangers badly needs cash - not for investment, but simply to stay solvent from month to month,"The only people likely to provide it are either going to demand very high interest rates, because of the risk of default, or because they're passionate about the club, or because it could give them control. "A company can go back to shareholders, offering them the right to buy shares in proportion to their existing holding to ensure no-one's shareholding need be diluted. "But the need for investment is such that the directors believed they needed to go much further with a big bang issue of new shares, giving more power to one or more new investors while diluting the power of existing ones. "Given the unhappy recent history of dominant shareholders at Ibrox, there's too much suspicion of directors for that to get past the annual general meeting, this year or last. "So it's back to those other options; seeking out short-term and expensive loans: or asking existing shareholders to find new funds for the club (after seeing the share price fall from 93p to 18p in the two years since the holding company floated): or looking to a rich individual who has an interest in gaining a controlling interest. "That's where Mike Ashley is key. The Sports Direct boss has nearly 10% of shares, and a merchandising partnership. His man, Derek Llambias, has just been made chief executive. "He's already bankrolled Rangers on apparently attractive terms. And he's got pots more money to keep doing so, though that would require an ever-bigger security over the assets. "At least one problem is that he's got to get past the Scottish FA, which wants an explanation for what appears to be his controlling interest in both Rangers and Newcastle United. "Unfortunately for the SFA, Mike Ashley could turn round and force them to face their own dilemma; either let him continue to invest in Rangers, thus taking control, or let one of their biggest club's collapse. Again." When Ashley took his initial stake in RIFC, the SFA board granted permission on the basis that a case was made for his involvement. Article 13 of the association's rules state that an individual cannot hold stakes in two clubs without the prior permission of the SFA board. Ashley signed up to an undertaking to not raise his stake beyond 10% and to not hold undue influence over the board. After loaning Rangers £3m, Ashley's long-time associates Llambias and Barry Leach were appointed as consultants. Llambias was then appointed non-executive director and was appointed chief executive last week. He was previously managing director of Newcastle United, the club Ashley owns outright. Breaching the undertaking would bring sanctions from the SFA, but at the same time Ashley can still seek permission to increase his Ibrox stake. Rangers intend to hold a share issue in the new year, to raise up to £8m by issuing 54 million shares at a discounted market price - which is currently 18p. Llambias would need to make a business case to the SFA board, which will hold the discussions informally following a board meeting at Hampden, that Ashley is the only source of the funding that the club requires to continue trading. The offer of £16m of funding from a consortium involving former Rangers director Dave King has never formally been removed, although it would require the support of 75% of shareholders. At the annual general meeting, shareholders voted to approve the share issue, but rejected the disapplication of pre-emption rights. "Not everything I do will be popular but everything I do will be in the club's long-term interests." When the share issue is held in January, existing shareholders must first be given the opportunity to maintain the size of their stake, or face dilution with new shares potentially being issued. A non-shareholder can still underwrite the issue, but they will not know how many shares they will end up with until after shareholders have taken up or declined their rights. Existing shareholders can also sell their rights to non-shareholders, or take up their rights and then leave the remaining shares unissued. This would reduce the amount of capital raised, although Ashley could agree to the refinancing of the £3m loan he made to the club and which is due to be paid back in April. Uncertainty continues at Ibrox, although Llambias also told shareholders that Kenny McDowall will remain as manager of the team until the end of the season "and perhaps beyond". McDowall was promoted from his role as assistant, following the decision to place manager Ally McCoist on "gardening leave".